Hellboy has had a tumultuous history with Nazis ever since they pulled him out of hell as a child, and remnants of the sinister German political party have caused trouble for Hellboy throughout his life. 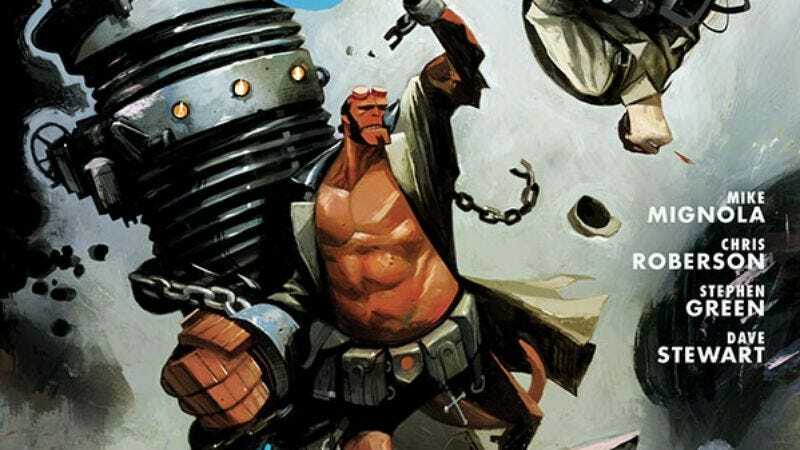 While Hellboy is presently back in Hell, his past continues to be ripe with stories to tell, and the latest Hellboy & The B.P.R.D. miniseries has Hellboy coming to blows with his ubiquitous enemy when he’s trapped in a UFO and whisked away to a Nazi base. The first issue of Hellboy & The B.P.R.D. 1954: Black Sun emphasized an ominous atmosphere as Hellboy and his B.P.R.D. colleague, Woodrow Farrier, traveled to the Arctic to investigate a mysterious attack, but the creative team ramps up the action in this week’s second issue as Hellboy takes on his Nazi opponents. Mike Mignola may be taking a break from writing and drawing Hellboy stories on his own, but his point of view still guides the character and his world as he continues co-writing the various books in the Hellboy universe. Mignola worked with Chris Roberson on the last Hellboy & The B.P.R.D. 1953 miniseries, and that fruitful creative relationship continues in Black Sun. Artist Stephen Green is a relative newcomer in comics, but his work on this series has quickly established him as a name to watch thanks to his expressive character work, evocative environments, and dynamic action. Having superstar colorist Dave Stewart as a collaborator makes Green’s artwork even more impressive, and these preview pages of Hellboy & The B.P.R.D. 1954: Black Sun #2 showcase the texture Stewart brings to Green’s linework as well as the energy Stewart adds to the fight with bright pops of color within the generally gray surroundings.